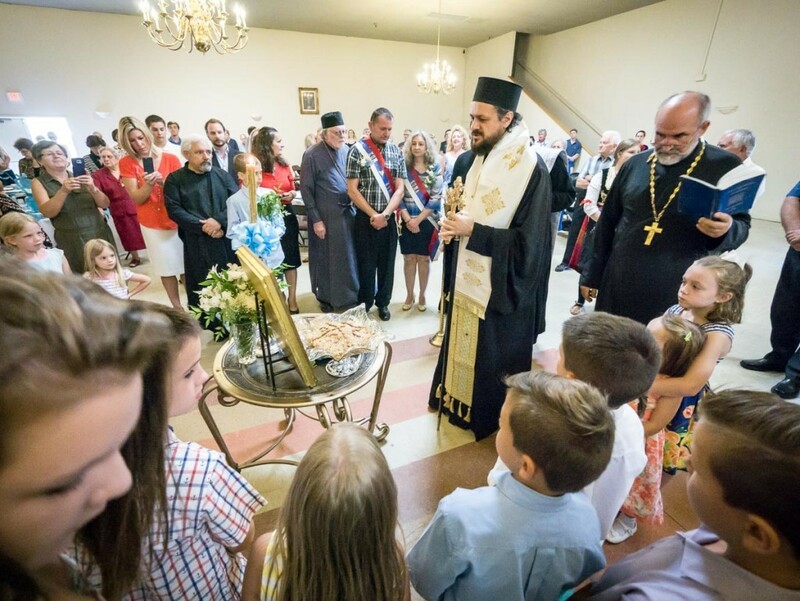 "Living a Moment in God's Time"
Fair Oaks, CA - On Saturday and Sunday, August 27-28, 2016, the Serbian Orthodox Church of The Assumption of the Blessed Virgin Mary in Fair Oaks California celebrated its Slava. One by one the cars started arriving and people began greeting each other. As we each entered our beautiful Church, we immediately felt the peace we would be blessed with for the entire weekend. We were not to be disappointed. As candles were lit, as icons were venerated, as our places were taken, all of us breathed in the scent of holiness. The flowers gracing the icons so lovingly made and placed by Luba Karnaaokh added the final element showing love to the Blessed Virgin Mary. With the entrance of His Grace Bishop Maxim, the newly assigned Diocesan Deacon Vladan Radovanovic, Deacon Dragan Stojanovich from Jackson, along with Proto Dane and Proto William, we were ready to begin. The evening Vesper service was beautiful and somber. Vladika Maxim led the prayerful group who had gathered. Three talented young Chanters filled the Church with their upraised voices. Our own Dusan Radosavljevic had invited two of his friends, Michail “Micho” Slavko (who is Bulgarian) and Dillon Diamandopoulos (who is Greek) to participate in the service. Several times the absolutely perfect harmony of their voices merged with the voice of our Beloved Vladika Maxim. At those moments the rest of us felt our hearts transported upwards. Later, Dusan admitted “we sang the first part of Vespers according to the long sticheraic genre that the Athonites repopularized. I felt like I had been transported to Chilandar Monastery.” (Mt. Athos) All of us who attended Vespers knew we had been truly blessed by the beauty and solemnity of the prayers we had heard. As we shared pieces of bread from the Five Loaves blessed during the Litiya, we entered our Cultural Hall where Miroslav Milovanovich, Food Preparer Extraordinaire, offered our evening repast. Our final Lenten meal of the Dormition fast was delicious and beautifully presented and served. Sunday morning we began gathering at 9 a.m. for Matins. At 10 a.m., as His Grace, Bishop Maxim approached the doors of our Church, he was greeted by six young girls clutching bouquets for him. Olivia Radulovich (the youngest) was excited when her bouquet was the one Vladika chose to carry into the Church. Divine Liturgy was solemnly served with all of us sharing in singing the responses. Our hearts caught in our throats as all of us recited together “The Lord’s Prayer” in both English and Slavonic. We could FEEL the love in our Parish at that moment. Slobodan and Elenita Dmitrovic were our 2016 Slava Kumovi. They stood proudly at the front of our Church along with their children, Davit and Delores. It was such a wonderful sight to behold as the Dmitrovic family led us through the Divine Liturgy and later as they led us in a Procession around the Church. Vladika Maxim shared his thoughts of the Blessed Virgin Mary with us as he spoke of our Feast Day. He explained how she is constantly protecting us and guiding us. He also explained how so very many of us turn to her in prayer in our times of need. He left us with a better and clearer understanding of the Mother of God’s place in the Church and our lives. When we processed around the Church, the prayers were offered to a group of quiet and respectful individuals. At the conclusion of the Liturgy, people lingered in the Church to share a few quiet words with each other, and then slowly moved to our Cultural Hall. It seemed as if we did not want to leave the beauty of the Service and our Church. However, the hall beckoned and we entered to beautifully decorated tables designed by Mileva Bruich. All was beautifully draped in blue and white – colors in honor of the Blessed Virgin Mary. The food prepared under the direction of Kumovi Slobodan and Elenita Dmitrovic and their family was delicious. Just two weeks earlier, the Dmitrovic family had celebrated their OWN family Slava honoring St. Ilija. St. Ilija is recognized as the greatest of the Old Testament Prophets. The Dmitrovic family truly dedicated their lives to Church during this month of August – and they did it lovingly. We are all grateful for their unselfish sacrifice. Slobodan’s heart showed plainly on his face when late in the day he smilingly admitted “This has been a wonderful day. My heart only speaks the truth, nothing else.” How wonderful to be so tired and, yet, so very grateful to God. The meal was served by members of our Serbian Dance Group “Tesla”. Attired in native dress they moved among the tables smilingly offering plates of food and desserts to the 200 people who had gathered to Break Bread together. After they served all of us, they then entertained us with a performance not to be equaled. Under the guidance and tutelage of Andjelka Gojkovich, this group has truly become a joy to behold. The highlight of the day was the Presentation of Gramatas. This year, Vladika Maxim recognized four of our very special members. The first Gramata was presented to Savka Mileusnic. She later stated, “I was so surprised to hear my name! I thought my heart would stop!” When reminded that the first organizational meeting for our Church took place around her and her late, beloved husband, Manojlo’s, kitchen table, she readily recalled those early days. “You know we knew Fr. Miladin (Garic) from the concentration camps. He was with my husband and me for 5 years in the same camp. So, when we were in Sacramento, we worked well together. I remember being the President of the Sister’s Circle for years; being the Church Secretary for years; cooking, cleaning, washing dishes for years. Everywhere help was needed, I was there. I never thought of it as work.” This is such a wonderful sentiment from soon to be 93 year old Savka. After the Gramatas, Vladika Maxim rose and made his final announcement of the day. The honor of Stavrophor (cross bearer) was affirmed upon Stavrophor William Weir. Happiness was again shared by all those in attendance in recognition of Proto William’s unselfish work on behalf of our Church group. Proto Dane Popovic thanked all who assisted in preparation for this Feast Day. Of special note, he reminded us that this weekend is the 10th Anniversary of His Grace, Bishop Maxim, being our Bishop of the Western American Diocese. Proto Dane expressed his gratitude to Vladika that he has been with us each of the past 10 years to celebrate our Slava with us. He thanked Vladika for his spiritual words this weekend and invited Vladika to come again. President, Milos Radmanovich thanked all for coming and especially those who prepared all for today’s wonderful event. The closing prayer did not end the feelings of brotherhood we all felt. A spontaneous burst of singing Serbian folk tunes broke out. The Gusala was played by Jovo Janjic who was surrounded by a group of men. Petar Dmitrovic, proud Father of Kum Slobodan, happily added his voice to the singing. It is fitting that at the end was a poignant moment of memory was shared. 14 year old Teodora Petrovich quietly remembered that Proto Miladin Garic had been in our midst last year at this time. In 2015, her family had been Kumovi for our Slava. It was touching that from the mouth of a youngster should flow the remembrance of the Proto that had ‘given’ us our Church and our Hall. Proto Miladin has not been forgotten. We honored some of us who have dedicated much of their lives to God and His Church. We enjoyed our Serbian heritage in dance and song. We remembered together those who were here and are now in the next life. We also look forward to Slava 2017 when the Grandson of Savka Mileusnic, Jeffrey Gray, and his wife, Lindsey, will be our next Kumovi.